FC 5 Premium 10554650 https://www.kaercher.com/ie/home-garden/hard-floor-cleaner/fc-5-premium-10554650.html The FC 5 Premium is the easy way to vacuum and wash your floors simultaneously. The additional detergent and rollers mean you’re always prepared for the next challenge. 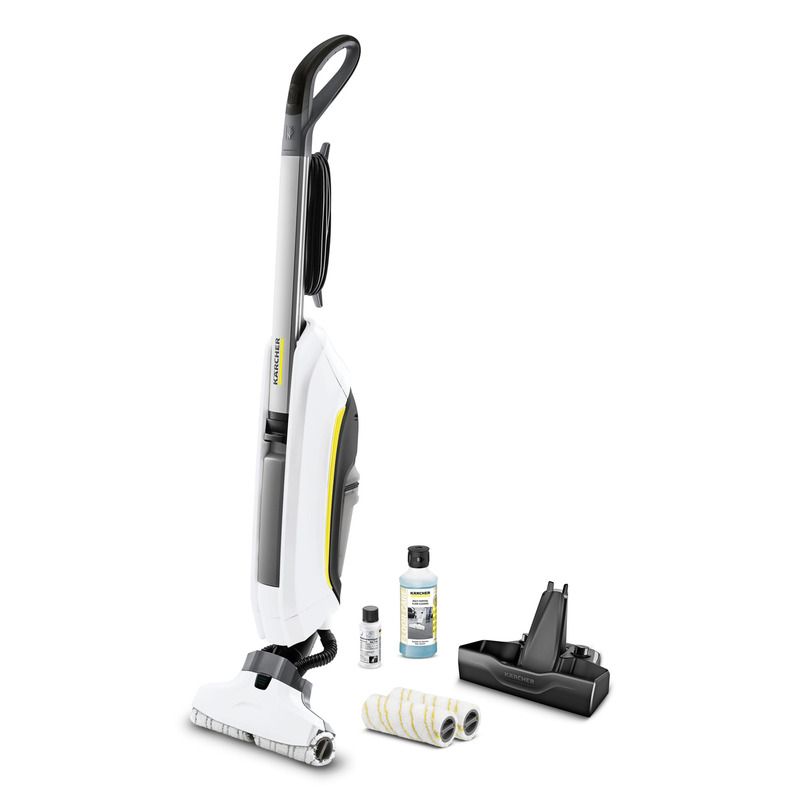 The FC 5 Premium is the easy way to vacuum and wash your floors simultaneously. The additional detergent and rollers mean you’re always prepared for the next challenge. The FC 5 Hard Floor Cleaner is the quick and easy way to vacuuming up and washing your floors in one. Our innovative SmartRoller technology vacuums up dust, small debris and pet hair, whilst controlling the flow of water to clean your hard floors gently yet effectively. The unique roller design enables you to clean right up to the edges ensuring nothing is missed; and with the built in vacuum function the FC 5 removes all of the dirty moisture and debris picked up from the super absorbent microfibre rollers leaving them clean and dry in just two minutes. The twin-tank system guarantees that the dirty and fresh water are never mixed and only fresh water is fed onto the rollers. You can also add detergent to remove the more stubborn dirt as well as leaving a fresh bees wax or citrus scent. What’s more is that the included cleaning station can then be used to store or refresh your rollers, your rollers can also be placed into the washing machine to give them a new lease of life. Additional detergent and rollers mean you’re always prepared for the next challenge. FC 5 Premium is rated 4.3 out of 5 by 366. Rated 2 out of 5 by Psmdriver12 from Poor Why would you have a clean water tank that hold 400ml but a dirty tank that hold 200ml? Mines been in for repair 3 times now, awaiting it’s arrival to see if it works this time, disappointed in marcher, poor compared to their usual high standards, Bessel now make a similar product, think I may change my allegiance if this is the best hard floor cleaner they can produce. Rated 5 out of 5 by Mac47 from Great Bit of Kit Bought this to deal with our kitchen floor and it works really well. It sweeps up bits, washes the floor and leaves it clean and not too wet so it drys quickly.